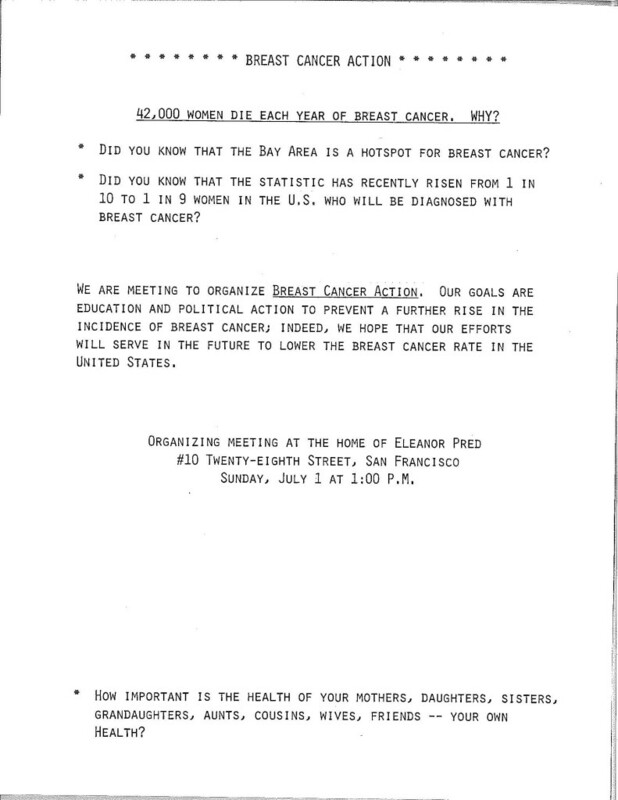 July 1st, 2015 marks twenty-five years since the very first meeting of Breast Cancer Action’s founders. Since day one, BCAction has been strictly grassroots and run by women living with breast cancer and those who care about them. BCAction’s founders got to know each other at a support retreat for women living with breast cancer. They wanted to find other like-minded activists who shared their anger that more wasn’t being done to address the disease they were living with – and dying from – and their urgency to do something about it, both for themselves and for their daughters and granddaughters. Twenty five years after that first meeting, we carry on our founders’ fearless vision and commitment to education and political action. When 40,000 women will die of breast cancer this year, it’s hard to say we’re celebrating anything. But we are certainly honoring 25 years of activism, education, challenging assumptions and telling truth to power. Of the small group of women who founded BCAction, Belle Shayer is our only living founder. Every time I talk to Belle, she says she can’t believe that the grassroots organization she helped found is still here and she is so proud of how strong and effective BCAction is. She also says she can’t believe that BCAction’s work is still so necessary. She would have hoped that 25 years later, the medical, research and regulatory communities had made more progress on this disease. We’ve accomplished a lot together, and we still have a long way to go. Both things are deeply true and we sit with this truth every day here at BCAction. In this issue, you’ll find a lot of information about what we’ve been up to in the last few months – including ways you can take action to help end the breast cancer epidemic. I hope you can join us October 8th in San Francisco, CA for our 25th anniversary event — save the date to honor 25 year of activism with us. I know some of you are planning to travel from out of state for the event, so be sure to also mark Monday, October 12th on your calendar, when a soon-to-be-announced special guest will present a public lecture. Thank you to all of you who are part of the BCAction community, whether you’ve been with us from the very beginning or have just found us recently. Every day I am reminded that BCAction only exists because a small group of people joined together to create change in how breast cancer was perceived and treated. Twenty five years later, we are carrying on that legacy together.